Does Ofsted (the UK Office for Standards in Education, Children's Services and Skills) do more harm than good? The evidence shows that, despite some benefits, Ofsted’s methods are invalid, unreliable and unjust. Educators are diverted from looking after students to looking after inspectors. A new model is presented, underpinned by five principles: education as growth; trust rather than fear; challenge matched by support; dialogue; and appreciative inquiry. There are nine components in the new model that are operationalized so as to dispense with league tables and grades. A single adjective – whether "outstanding" or "inadequate" – cannot sum up all the complexities within a school. There are welcome signs that Ofsted is willing to act on constructive criticism. Ofsted doesn’t belong to the government but to the citizens of Great Britain, and they have a right to call for change. This is the essence of democracy – the freedom to think differently on behalf of others. 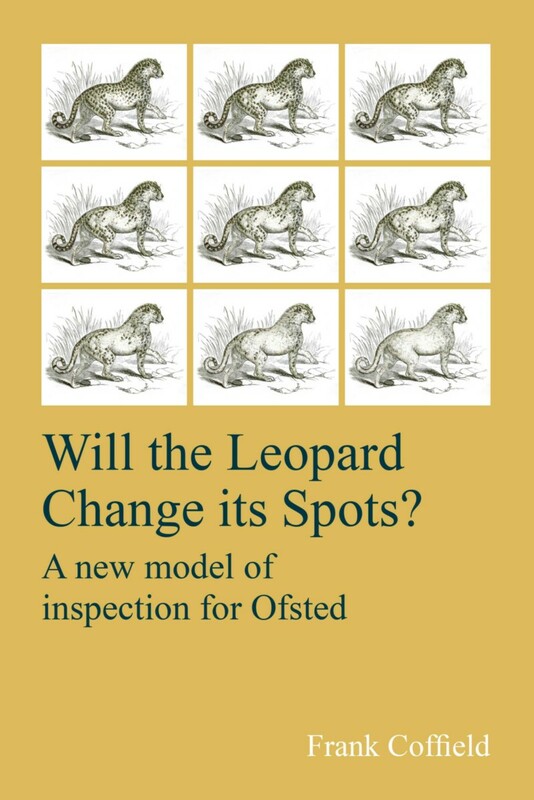 "Frank Coffield’s comprehensive assessment of the current model of inspection is merely the background to his masterly exposition of the principles that should underpin its replacement. This exceptional book charts the way to the transformative evolution of a new and integrated model of both education and its inspection. Everybody involved with our schools and colleges needs to read it." "An excellent proposal for a new, principled and more democratic form of inspection that could genuinely lead to improvement in our education system. Let the debate commence!" "This impassioned appeal for lifelong learning is underpinned by democratic values, promoting professional trust over the fear engendered by the reductive absurdities Coffield exposes. He is here confirmed as the unparalleled public intellectual of his field." 2. Does inspection do more harm than good? PART 3: What are the Chances of Reform? Frank Coffield retired in 2007 after 42 years in education, first as a teacher in a comprehensive and then in a boys' approved school in Scotland. He was also a lecturer in education at Jordanhill College of Education in Glasgow and Keele University in Staffordshire, and Professor of Education at the Universities of Durham, Newcastle-Upon-Tyne, and the Institute of Education, University of London.